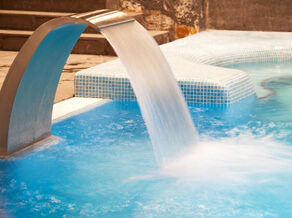 Opening your pool for the summer should be a low stress, highly anticipated event for the entire family. Assuming you’ve done some winter preparation by covering the pool and protecting the pump, the pool’s opening day should proceed free of trouble. Here’s what you need to do. You may encounter fall and winter residual leaves, dirt, and general weather buildup on and around the pool. Before removing the cover, blow any leaves or debris off the pool cover and the surrounding deck or patio. If you notice water sitting on the cover, use a pump to remove that standing water and prevent it from working its way into the pool. Once you remove the cover, take the time to clean and dry it properly before storing. If you have the space, spread out the cover and spray it off with the highest pressure your hose allows. Let the cover dry. Then before folding and storing it, sprinkle a light layer of talcum power over it to prevent binding or sticking while it’s stored. The cooler the storage, the better. Check the skimmer water level. For the pump to function properly, the water needs to be in the middle of the skimmer opening for proper circulation. Add water accordingly. While waiting for the pool to fill, check and test all handrails, ladders, diving boards, and slides for loose bolts or other potentially unsafe conditions. Check to see that all equipment is in working condition. Check hoses, pumps, and filters according to the manufacturer’s guidelines. Start the circulation system and allow it to run for 8 to 12 hours.